This post is sponsored by Campbell Soup Company. The opinions expressed are my own. You have probably heard how prevalent heart disease is. In fact, heart disease is the leading cause of death in women in the United States. With risk factors steadily on the rise, it has never been more important for women to maintain a healthy lifestyle. 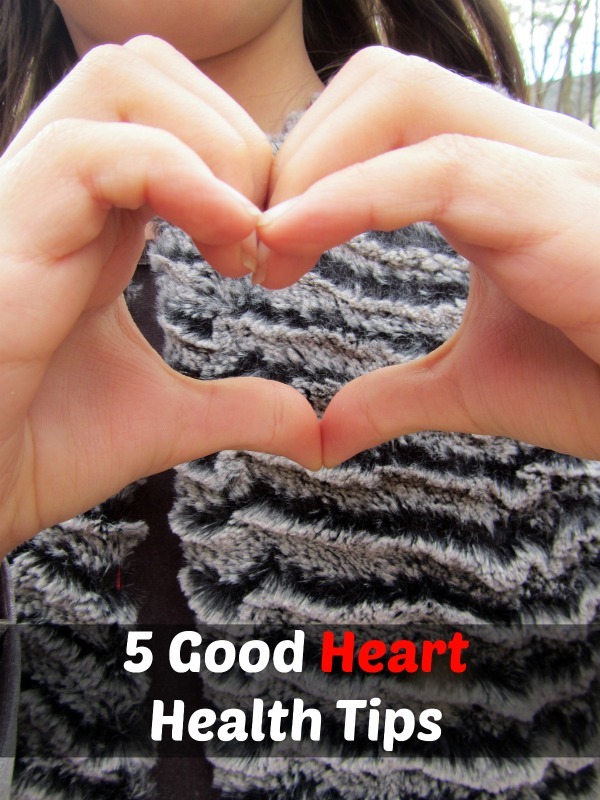 Here are five good heart health tips to help you do just that. The American Heart Association recommends 30 minutes of exercise most days of the week to prevent heart disease and stroke. You can walk, run, do jumping jacks, sit up, and push ups, or any other physical activity you enjoy such as yoga or rock climbing. You may even want to get your 30 minutes of exercise with your partner to make it more fun. Keeping stress out of our lives isn’t easy, but take the time to unwind with breathing exercises, yoga, or a warm bath. Getting enough sleep will also help your body deal with stress better and maintain your weight better. Reduce sodium in your meals by using less salt and choosing low sodium options when available. Try baking, roasting or steaming, instead of frying. Choice lean meats and whole grains for good heart health. Eat plenty of in season vegetables. When choosing prepared foods, pick ones that are heart healthy. You may also wish to try effective healthy heart supplement. A few tips for finding heart healthy foods below. 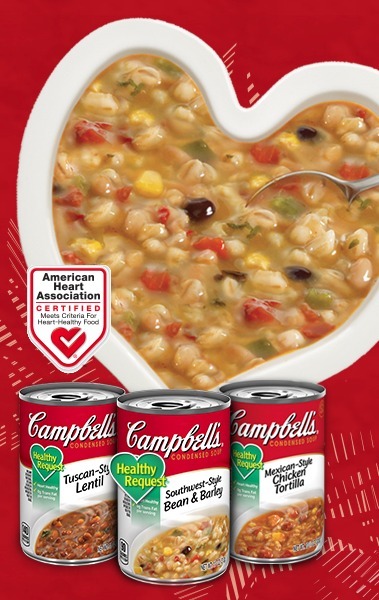 Campbell Soup Company is dedicated to helping people care for their hearts by providing delicious, heart-healthy foods and recipes as part of their continued support of the American Heart Association. Campbell Soup Company offers a diverse portfolio of foods that balance great taste with nutritional value, including more than 80 options that meet the criteria for the American Heart Association’s heart check mark. That is a lot of variety! Certified Campbell’s products include Healthy Request® soups, V8 beverages, Prego pasta sauces and Pepperidge Farm whole-grain breads. I like that Campbell makes it easy to incorporate delicious and easy-to-make heart-healthy products and heart-healthy recipes into your daily life. 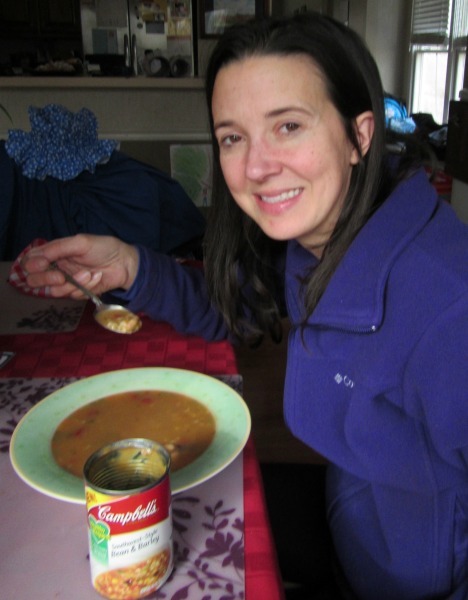 My favorite Campbell’s Heart-Healthy soup is Southwest Style Bean and Barley. What’s yours? Campbell Soup Company is launching the Address Your Heart with Campbell’s Pinterest Sweepstakes (with a grand prize of a trip for two to the luxurious Miraval Resort and Spa in Tucson, AZ) to encourage small steps towards making heart-healthy lifestyle choices every day. With the Address Your Heart with Campbell’s Pinterest Sweepstakes, you can enter to win a variety of daily prizes – from heart-healthy products to bakeware and kitchen utensils – throughout American Heart Month (February). You can enter here! Which good heart health tip is your favorite? I hope you try to incorporate all five of them. I do! Will you enter the Address Your Heart with Campbell’s Pinterest Sweepstakes? Nice Post, thank you, almost people now have this stress problem. so lets get relief. lets share this post it is very useful to all. Good information about heart health. Thanks! I’ve read all the article and its help me a lot.